This is a Korean name; the family name is Sohn. Sohn Kee-Chung (August 29, 1912 – November 15, 2002) became the first Korean athlete to win an Olympic medal when he won the gold medal in the Marathon in the 1936 Berlin Olympics. In 1910, Korea had been annexed by the Japanese Empire, and remained under the control of Japan until Japan's defeat in World War II. The Japanese governor in Korea did not permit Sohn and his fellow Korean athletes to compete as Koreans; they participated in the games as a member of the Japanese delegation, with Japanese names. Sohn was registered under the name Son Kitai. The Korean people were overjoyed at the news that he had won the Gold Medal; however, many were angered by the fact that he had to use a Japanese name and wear a Japanese uniform. One newspaper in Seoul went so far as to remove the Japanese flag from his photo when they published the news, and eight members of the newpaper staff were jailed for their act of defiance. Born in Sinŭiju, North P'yŏngan Province (North Korea), Sohn Kee-Chung was educated at Yangjeong High School (양정고등학교) and Meiji University in Japan, from which he graduated in 1940. Between 1933 and 1936 he ran 13 marathons and won ten. He set the world record of 2:26:42 (2 hours, 26 minutes, and 42 seconds) on November 3, 1935, which lasted about ten years until his trainee Suh Yun-Bok won the 1947 Boston Marathon with a new world record. His personal best was even better, 2:25:14 on a course 520 m longer than the standard one (fairly equivalent to 2:23:28 for 42.195 km). Sohn entered the 1936 Summer Olympics in the marathon. In 1932, Juan Carlos Zabala from Argentina had won, and he spent the first 28 km in the lead until Sohn and Ernie Harper of the UK passed him together. Not long after, Sohn pulled ahead to win, finishing the 42.195 kilometers in 2:29:19.2. He broke the olympic best and received the gold medal. Harper won the silver and his Korean teammate finished third for the bronze. 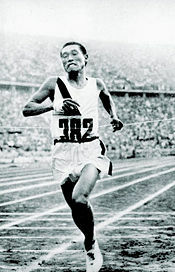 Suh Yun-Bok, the winner of the Boston Marathon in 1947, who broke his world record with a time of 2:25:39. Hwang Young-Cho, gold medalist in the 1992 Summer Olympics marathon—At the age of 80 Sohn traveled to Barcelona to see him run. At the 1988 Summer Olympics in his home country of South Korea, Sohn Kee-chung was given the honor of carrying the Olympic torch into the stadium at the opening ceremony. He authored an autobiography entitled My Motherland and Marathon (Hangul: 나의조국과 마라톤). He was honored with the Order of Civil Merit (Hangul: 국민훈장) and posthumously, the Grand Cordon (Blue Dragon) of the Order of Sporting Merit. Sohn Kee-Chung died at the age of 90 at midnight on November 15, 2002 from pneumonia, and was buried at the Daejeon National Cemetery. He lived long enough to witness the 2002 FIFA World Cup Korea/Japan. An emotional Sohn at the medal ceremony. At the time of the Berlin Olympics in 1936, Korea was occupied by Japan as a de facto colony. Sohn Kee-Chung was forced to compete with the Japanese team using the adopted Japanese name of "Son Kitei" (ｿﾝ ギｼﾞｮﾝ), the Japanese pronunciation of the Chinese characters making up his name. As a stern nationalist, Sohn Kee-Chung refused to sign his name in Japanese and signed only his Korean name, and would even sketch the shape of Korea beside his signatures. When interviewed both he and his Korean teammate Nam Sung-Yong would clarify that Korea was his mother country. At the medal ceremony, Sohn was overcome with sorrow and shed tears to see the flag of Japan raised and the Japanese national anthem played. Japan was officially credited with Sohn's gold and Nam's bronze in its 1936 Summer Olympics medal count. One of Korea's domestic newspapers, the Dong-a Ilbo, published a photograph of Sohn and Nam at the medal ceremony with the image altered to remove the Japanese flag from their uniforms. It so enraged the Japanese regime that eight persons connected with the newspaper were imprisoned and the publication suspended for nine months. In 1970, a South Korean Parliamentarian defaced the word "Japan" from a plaque honoring Sohn Kee-chung in Berlin, and replaced it with “South Korea”; the original name was re-engraved after consultation with the IOC. 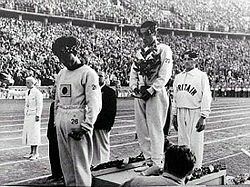 Sohn was the flag bearer for Korea at the 1948 Olympics in London and the final torch runner, entering the Olympic Stadium in the 1988 Olympics in Seoul. 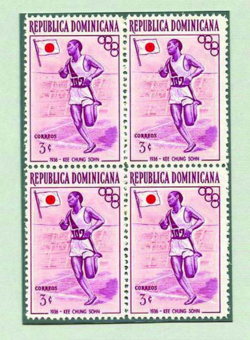 The Dominican Republic (1956), Haiti (1969), South Korea (1992), and St. Vincent (1994) honored Sohn on stamps and by postmarks. Just prior to the IXth Olympiad in Berlin, the Greek newspaper Vradiny which has always been (still is) closely associated with sports sent the Olympic Organizing Committee an ancient Greek helmet to be awarded to the marathon winner. The Olympic Committee, in line with its rules that competitors must be strictly amateur and receive no remuneration for their performances, did not award the helmet to Sohn; it was donated to the Antikmuseum in Berlin and stayed well protected for 50 years. It finally came into Sohn's hands when Willi Daume, IOC member and then-president of the (FRG) German Olympic Committee, presented it to him at a reception in West Berlin on August 10, 1986. Sohn was 74. The helmet is of the early Corinth style—cheek and nose guards—21.5 cm high, made in the sixth century B.C.E. during the heyday of ancient Greek olympics. It was discovered at Olympia by German archaeologist Ernst Curtius in 1875. On March 7, 1987 it became Korean National Treasure No. 904; Sohn donated it to the National Museum of Korea. Replicas of the helmet were awarded to the winners of 10 km, half marathon, and full marathon of the 2006 Sohn Ki-Jeong Marathon. ↑ Sohn's win put Japan medal count at six gold (and four silver), and Nam's third place finish made eight bronze, for an overall eighth place among nations. The Netherlands had six gold, four silver and seven bronze, thus counting barely fewer than Japan and placing ninth. Great Britain placed tenth with four golds, seven silver, and three bronze. ↑ Thank you, Athens!, The Flame, 2004. Retrieved December 18, 2007. 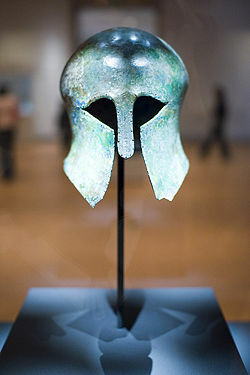 ↑ Willi Daume, The Marathon Runner's Greek Helmet, LA84 Foundation. Retrieved February 5, 2008. This page was last modified on 9 October 2015, at 14:48.